Chicago’s alternative weekly, the Chicago Reader, has demonstrated more bravery than its daily peers, and is today, Jan. 31, publishing a version of the full-page ad in this week’s edition. A Chicago-area member who was sexually abused at age 13 by his parish priest suggested and underwrote the FFRF ad and is using a portion of his church settlement to pay for the plea to the public to abandon the Catholic Church. The person asked that the ad be timed to run during National Catholic Schools Week (Jan. 27-Feb. 2). After encountering print censorship, FFRF is fighting back by placing prominent billboards all over Chicago, including a 20-by-60-foot sign on the Kennedy Expressway west of Montrose stating, “Value Children over Dogma: It’s Time to Leave the Catholic Church.” The powerful image depicts a small schoolgirl hiding her face. That message will go up in February for the entire month. Additionally, starting today, Jan. 31, 11 digital billboards throughout the Chicago area will be flashing the message: “It’s Time to Leave the Church.” Those signs will stay up through Feb. 10. Click to view billboard locations. See map below. 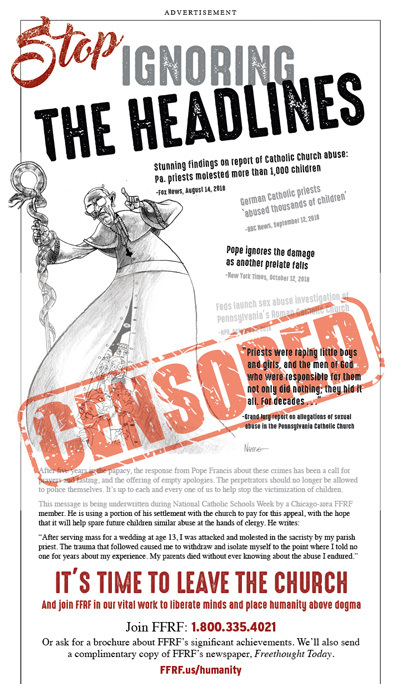 The ad in the Chicago Reader lists a series of real newspaper headlines about the ongoing revelations of massive priestly abuse of children and the subsequent Church cover-up, urging readers to stop supporting the world’s largest and most powerful religious institution. The suppression of FFRF’s ad by Chicago’s two dailies shows the power of the Catholic Church to intimidate its critics, maintains Annie Laurie Gaylor, FFRF co-president. The Freedom From Religion Foundation is a national freethought association dedicated to keeping state and church separate, with almost 32,000 members and several chapters all over the country, including nearly 1,000 members and its Metropolitan Chicago chapter in Illinois.